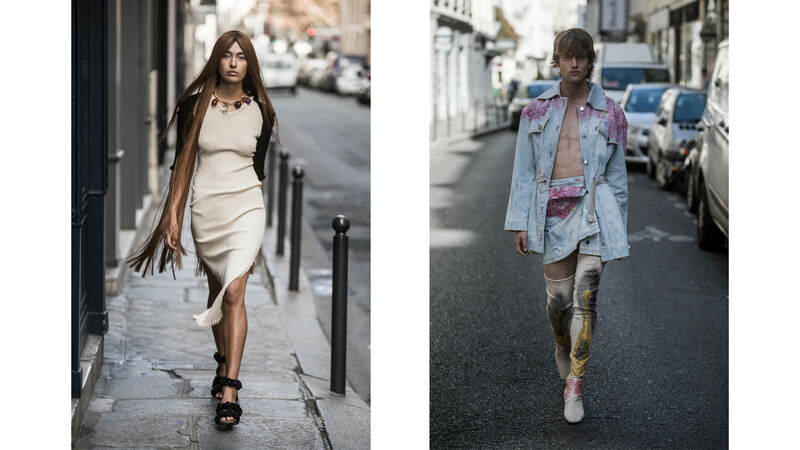 The Neith Nyer’s Spring / Summer 2019 collection is a tribute to Paris, a place of both hope and despair, told through the lens of a pageant queen trying to make her way to the top. Francisco Terra had in mind this girl full of dreams but still marginal, a spooky gothic kid from Bastille that dreams to be Miss France. And will work hard to make her way to her dream. This season incorporates the visual symbols of Paris city life, a fashion capital rife with visual contradictions. There is a certain darkness beyond the Eiffel Tower and romantic flowers handpainted by the artist Fay Brown, contrasted with shops and boutiques. Printed « paper marabout, » small sheets of paper distributed in Parisian metro stations designed by the world of money or love problems, is an other leitmotif used as stamps to mark the garments. More than ever, this season is a reflection of Neith Nyer’s DNA, a blend of street and couture, high fashion and bad taste. It is also a comeback to the roots of the brand, embracing DIY techniques with luxury fabrics.